Glamorous doesn't have to be expensive. Let's celebrate a decade of Glamour by showing our support to Nisce Skin 'n Face by visiting their clinics. Why not celebrate Christmas as early as November by treating our love ones with glam treatments from Nisce Skin 'n Face? If you follow me on twitter, I'm sure you have read my tweets that my father enjoyed their facial service. It's his first time to have facial cleaning and I'm very happy that Nisce Skin 'n Face (Ali Mall Branch) did not disappoint him. He went home satisfied and can I say hooked because he's planning to do this monthly. Not only they gave us wonderful service but they also offer skin care products that's effective and affordable. Yes it's effective, I made a review of their Dr. Skin+ Toner and Nisce Whitening Soap. Anyhoo, Nisce Skin 'n Face celebrates a decade in skin care and recalling the history, Nisce Skin ‘n Face has touched so many beautiful lives. The clinic was in fact a fruit of passion passed on to Atty. Blaise Nisce and Marie Antoinette Nisce by their mother Dr. Edna Talavera- Nisce. They started the business at San Fernando City, La Union, treating diseases of the skin, hair and nails back then. As a respond to the growing demand, they decided to increase their clinics putting their second in Pangasinan and eventually in Metro Manila. Aside from the clinic, they also provide products as a response to the increasing needs for effective treatments. These are formulated by Dr. Edna herself and Nisce Skin ‘n Face’s world-class research and development team to suit every skin type. It is dermatologist tested and approved. They are proud to say that these products are all created in-house. “We created these [products] locally, no import goods involved”, said Dr. Edna Nisce, founder and chief dermatologist of Nisce Skin ‘n Face. They also provide services like spa and manicure/pedicure. For ten years in dermatological line, they have already established a reputation in skin care. Dr. Skin that provides a total care for achieving healthy and beautiful skin. Nisce Superblock with intense SPF 80. GlutaCurve and FitCurve for bulging fats. Blaise skin care line was created for men as well. Now on their 10th year, they have also launched a new brand ambassador, actress Bela Padilla, who embodies the fresh, highly approachable, and excellent service provided by Nisce in the skin care industry. The beauty clinic is looking forward to a nationwide recognition from their humble beginnings in Northern Luzon to having 18 branches nationwide. 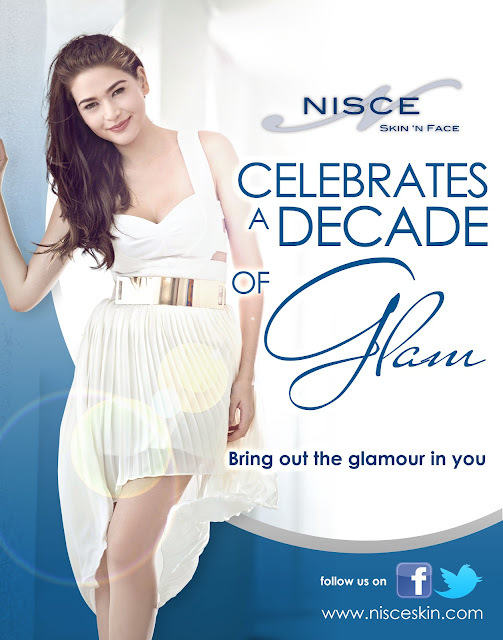 Ten years of boosting confidence and of enhancing beautiful Filipinos, Nisce Skin ‘n Face celebrates a decade of bringing out the glam in every Filipino since 2002. I like the article, it does not only inform but educate us on how to be beautiful.